Limited Slip Differential Gear or simply referred in the motorsports industry as LSD, is a technology used in the vehicle to control the torque applied to the left and right drive shafts. This, in such a way to limit the effect of slippage as present in an “open” or standard differential gear. Also, today, it is used in the coupling between the front and rear of an AWD system. But we will concentrate on the explanations based on the right and left for now for the sake and ease of understanding. And, because the center coupling of an AWD operates on similar foundations and technologies and then some. The standard differential gear idea has been around since the invention of powered vehicle. The gear system is used to allow the outside and the inside wheels, to turn at different rates to accommodate for the different distances the wheels travel when the vehicle is turning left or right. Naturally the outside wheel must turn more in the same amount of time, to cover the greater distance. However, in this simple mechanism that has existed for centuries which apply power from the engine or motor, is not prioritized to give maximum traction. It is only rather, used to provide smoothest, most frictionless, vehicle operation disregarding any need to go faster in each traction level. The standard differential is the norm of almost all modern vehicles which do not have a priority in racing. It is the most efficient form of simple differential control of the left and right axle. It is open to spin one side needlessly, if traction of one wheel is greater than the other. A free-spinning, slipping wheel wastes rotational motion from the other wheel with ample traction. The car goes nowhere in this case. The open differential allowing one wheel to free-spin, also can cause instability when the vehicle is very limited on grip at the tires on one or more wheels, and cause safety hazard as well. Therefore, on modern automobiles, an additional mechanism of electronic “traction control” or TRC is integrated. The Electronic Traction Control, however is based on maximizing stability by reduction of power. It is judged by the vehicle electronic system, and either applies the brakes, cuts engine power, or both, to restrict the motion of the wheel in question. In a more sophisticated Vehicle Stability Control or VSC, called different things by various auto makers, basically add much more sophisticated systems to stabilize the car in motion, via power modulations and brake actuations. And in some cases, even steering controls with electronic monitoring of the vehicle conditions, to assist the mundane driver in stabilizing a potentially dangerous condition. However, by design and principle, these systems all work on the same basic problem of the standard differential by slowing the car. To slow the car by cutting power until such time that the programmed device, decides to allow power again. This is not however, an ideal way to regulate a motorsports vehicle, as our goal is to move faster, and propel the car forward, as well as to give the driver total control. The open standard differential with or without electronics becomes a problem, when the driver’s intent is focused primarily on covering ground faster. With importance of transmitting the power to the ground in a race car being the key. So throughout history, there were many new additions and modifications, that were included in the design of the differential gear to accommodate increased traction, and less wasted motions of the wheels. Earliest form of these being a necessity for off-road vehicles. 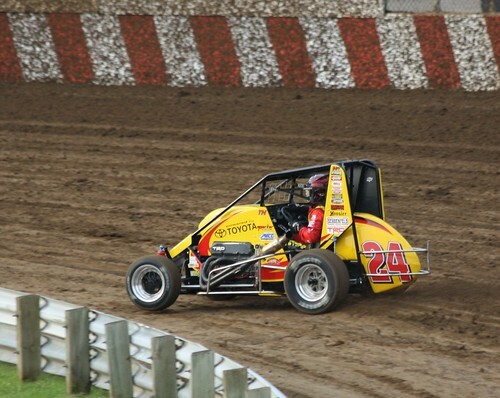 There are some really classic historical dirt racing, such as Midgets in the USA, as well as others which do use a fixed axle though, as per regulations for the sake of absolute simplicity. These application are predominately in a dirt oval however, where the cars are constantly racing in a fixed cornering state in slight drift, almost negating the need for a differential. The simplest way for preventing free-wheel spin, is to eliminate the differential aspect. In the old days, off-road cars had no differential gears, or had the left and right parts welded together to eliminate the feature. Well, as you can imagine, this really defeats the purpose of differential gears altogether, and presents all sorts of issues. Binding of two wheels trying to move at different rates were designed to be solved by the addition of the differential gears. When both wheels are locked, there is a ton of friction even in mundane driving, the vehicle will resist any turns by not being able to spin the left and right at different speeds. It can introduce instability in a corner as it put heavy loads on one of the two tires with unbalanced torque difference. This setup will also increase axle, hub, and suspension component binding and failures as well. Such idea has seen better days, as we cannot consider this to be an improvement as much as increasing more issues. When the need to lock the left and right involves crawling around in rocks, or only going in a straight line, we can have what’s called part time locking devices. The early, classic form of a solution was the “Locker” which is a part-time, fully locking differential. This locker can be coupled on, or off by electric actuators, or manually locking the system via external hub link. This is still popular in ¼ mile drag racing, as well as in simple off-road vehicles. And, it is effective in those types of basic needs for the most part. Not a perfect solution, but convenient. It is the same as welding the differential as above, with only a simple feature added that allows defeating the lock. So, it’s 100% lock, or 100% open. It can get you out from being stuck in mud, or drive a dragster straight as an arrow even with the front wheels pointing at the sky. This isn’t very useful as soon as the need to turn, however, and corner smoothly in racing that involve cornering. What we are trying to achieve is locking more ideally, and progressively, everything between the full lock, and full open. So having covered all this, we can now concentrate on the topic here, of the Limited Slip Differential Gears. As the name implies, the system in topic of discussion is “limited slip.” There are many systems in automotive history that successfully achieved this in very diverse ways. Similar in goal, yet different in mechanism, and behavior, and running a whole gamut of budgets. But these all have an aim to solve the issue of free-wheeling side of a basic differential gear. And, providing enhanced traction and positive distribution of power to both axles at all times, on any variable surface, with stability, and driver control in more sophisticated ways. That is tarmac racing, autocrossing, rallying, gymkhana, and off-road raids, or basically encompassing what we call motorsports. Here, we will now cover the different systems of the limited slip. It is very important to note the key differences in each system. And the focus is how things actuate to vary the lock between 0~100% and how that affects the builder’s ability to tune them, and driver’s ability to use them in racing. We will cover this one by one. The viscous system is the most inexpensive form of the differential gear system, and was used in lower priced, smaller, lighter power application in the past, mostly as original equipment in small sports cars. The system relies on a set of plates on each axle, and another set of plates on the differential case which receives power from the engine. In between the very tight space between these plates, often with positive flow-surface casing, some form of viscous oil is residing within. When one side has a very high rate of slip, meaning difference between the speed of axle and case, the fluid will pressurize with increased viscosity of fluid, and motion of the fluid, and act to counteract the speed difference of the axle and case. If you know how a torque converter works in an automatic transmission, this is similar, only it transfers power to axles, and not between transmission and engine. This is effective to an extent but has a long delay due to fluids having to slosh around and push on the other side. It isn’t a physical mechanical lock so it can only handle so much before it slips again, and generate lots of heat making things worse for the fluid as it thins and cooks. Therefore, it is only selectively effective on a car that has very little power, light in weight, and equipped with low-grip tires. The effect of this design, because the plates are never fully engaged or locked, is limited in handling very high power. Because this design uses fluid as the locking agent, action can be affected by temperature, as well as type of fluid, and even the degradation of the fluid as well. It doesn’t afford any way to customize it either in any useful ways. The nice aspect of the viscous units, is that all active parts are suspended and operated by fluid. So it requires only fluid maintenance. The actuation effect is delayed and gentle, providing traction increase with no aggressive, sharp handling effects. Ideally, then, on a mundane, daily-driven car. And inexpensive for auto makers to provide as owner costs are minimal as well. Today, these have almost become extinct though, as modern cars exhibit much higher levels of power and weight, as well as tires having much more grip than in the past. Today’s requirement for cars are much heavier on power handling requirements. The Torsen and Helical systems I have gathered into one category, but it is very important to note that the term or name “Torsen,” is a trademarked designation for a device patented by JTEKT Torsen NA. Inc. And is a very specific design version of the helical system. The latter term, helical, refers to a more general system of LSD in this category. The helical system comes in many shapes but all of them utilize the principle of complex but natural mechanism of gear sets in varying shapes, and sizes, and resistance created by various gear ratios, usually consisting of a series of precisely arrangement of gears, put together with spur, worm, helical, and multi-axis, power distribution layout. However, the helical systems are rather complex to manufacture for smaller, customized needs, and expensive in small batches. It is also extremely specific in character, so tuning the efficacy for driver variables is usually not possible. Aside from changing the sizes of gear sets, all of which are very precision manufacturing process, or adding more complicated mechanism, it can’t be easily altered. And, as you can see, very expensive to do. For extremely high-budget systems where such design can be dedicated to a specific car in a specific target use, this is the ideal system. It isn’t considered affordable when it comes to customization by layman and grass-roots racing though, where high degree of customization is preferred and with limits on the budgets. This is why, the helical systems are prominent only in factory cars and at top level racing construction, which are set to very exacting roles. Incidentally that is where one usually sees the trademark logo of “Torsen™. “ And is why they are so familiar to us in name. Because they are the patent holder for much of the design, there are very few aftermarket devices which are designed around helical systems. The clutch pack mechanical LSD is the last form of Limited Slip units I will describe, and are most popular in aftermarket motorsports systems. While the basic design is not new, there have been huge advancements in this category. The system operates based on the mechanical principle of outer pressure plates, actuated by cam pins, to push a set of clutch packs on either side of the differential to lock together upon torque input. Because the plates and cam systems can be very easily customized for lock rate and speed, very fine adjustments can be made at the time of assembly. This is done via use of varying cam angles on pressure ring bodies, friction plates, as well as number of other technologies from fluid viscosity, to preload of pressure springs. Because the plates lock by being pressured into each other as clutch packs, there is a certain level of maintenance traditionally from gradual wear over time. And in some cases, do make rather discerning noises for those who haven’t used one before, in the form of chatter or grinding as the plates slip before lock up. It’s perfectly normal though, and most of today’s systems are not obtrusive at all after one is acclimatized. Modern LSD systems incorporate innovative designs to minimize this sort of thing greatly compared to the past. Approximation of a mechanical clutch pack system LSD. Because of the ultimate level of flexibility in tuning the LSD, and catering creative designs to meet the very specific applications, all of Cusco LSD units are based on the mechanical clutch-pack type limited slip differential gears. All the Cusco LSD are fully customizable with clutch plate arrangements, type of plates, varying degrees of profiles in cams pressure plates, and with different “initial torque” preload systems to match precisely to the intended use, and preferences. We will cover these basic feature and terminologies that are common to all Cusco LSD. Friction or Clutch plates in the Cusco LSD provide the actual high-torque locking action, and there are sets for each of left and right consisting of outer and inner plates. These plates can be arranged at the time of assembly to reach desired effects by choosing how many of the plates will serve as clutch packs, and others as spacers. This determines the overall friction surface area for the clutch packs to lock up. Needless to say, the more we stack as clutch role, the more locking strength we can achieve. Also, the pressure rings are the main internal bodies that get pushed outwards by the cams to press the plates into each other. The pressure ring strengths and margin of control by given variables of driveline torque, can be adjusted by using cam and pressure plate combinations. The more aggressive the pressure rings and cams pins, the more immediately the actuation will reach 100% lock, and vice versa. The pressure rings and cams also come in one directional actuation and varying degrees of dual direction of acceleration and deceleration force. 1 way refers to the LSD actuation tuned to operate only under acceleration force. 1.5 way refers to the LSD actuation of both ways, but with varying degrees of lock rate that is reduced for deceleration side, and higher rate for acceleration side. For simplification sake, we refer it to 1.5 but the variances can range from 35~85% in the deceleration side compared to the acceleration side, by the pressure ring options we have. 2 way refers to both sides being equally aggressive in locking force, again in various levels of cam profile. The initial torque refers to the amount of preload in a specific LSD unit. The higher the initial torque, the more lock it is preloaded before it is actuated by the cams and pins in more mechanical ways. A high initial lock reduces the time it takes to fully lock, and drivers will feel more consistency in behavior as open state is slightly limited from the start. A lower initial torque preload will allow more freewheel at low or no engine torque applied, and can be tuned in such way to reduce locking action in more mundane use of daily-driven cars. The level of initial torque is customized by the following features on the Cusco LSDs. The Cusco MZ type LSD are the most traditional and familiar to racing communities world-wide, and are the based on the original clutch pack design. The MZ units feature a cone-plate spring to provide an elevated level of initial torque, and actuation transition to mechanical lock is extremely linear. Serious racing fielders prefer this very high response, linear, and positively predictable action, giving confidence to the vehicle character, and least number of variables in the handling effects. The system is also preloaded consistently, and affords maximum durability in frequent level of abuse as well over grueling surfaces like gravel and in tight transitioning, short-course road racing such as autocross and gymkhana. But being the most basic of design, the maintenance does involve periodic oil changes and clutch plate replacements. But, if you look at the userbase, it’s something race operations do regular anyway. Cusco RS systems utilize a set of coil springs in lieu of cone springs to provide the initial torque but in the same main mechanical actuation system as the MZ above. Since the RS coil spring packs are linear springs and not progressive, they can be adjusted as well unlike MZ, and can be made to provide a larger range of free-wheel state to lock range. The locking response can be tuned to provide very quick and linear as well. Pro-Adjust pressure plates can be optionally used in RS and MZ units, and allows use of separate cam chips so the same pressure ring can be used while wide selection of cam angles can be custom tailored at the time of build, increasing the level of fine tune without the added cost of separate pressure rings for each profile. This is useful in very advanced LSD setup for professional racing use. The Cusco Hybrid LSD systems employ fewer pressure plates, and a stagger of plates to be milder than standard RS and MZ units. This setup accommodates and matches vehicles with torque converters (automatic transmissions and CVT) and milder tire grip, allowing daily driven cars to be more docile and gradual in actuation character. It is closer in character to many OEM level LSD in actuation speeds but affords much higher and precise locking needed for motorsports type use. The Hybrid unit also uses special outer plate and coil spring sets, so that the entire plate set floats on the driveline-side of the powertrain, and away from the wheel side. This allows for a more silent operation void of chattering that is common to varying degree on more aggressive setups. So what’s the right setup?!!! Well honestly this is the most difficult part to answer. The short answer is it depends on the driver, stage, and intended use. But mostly the driver. If one may elaborate, there are general recommendations and theories, as well as experience-proven results we can base recommendations, none are exacting in specifics. It isn’t exacting simply because Cusco LSD offers extremely diverse level of customizations to suit your needs and preferences very precisely. But like any sports equipment, your car is a fine-tuned machine of many configurations and thousands of components that all add to the complexity. Even among professional drivers, in the same race in the same platform car, can prefer a slightly different setup. The only way to grow as a driver and choose your preferences is to use one, and through repeated experiences to hone the LSD setup precisely for you. Also, since the installation of a Limited Slip Differential is not a typical DIY process, and often in most cars, require a very refined skill set as well as specialized equipment and tooling, we do recommend you find an experienced professional near you, to rely on the service and installation of your LSD units. Professional shops specializing in the Cusco LSD can offer abundance of advice, as well as options with regards to goals and your budgets. But we do generalize the different systems into categories of use, and by nature of the most obvious of applications and uses, we can narrow down the following recommendations for you. Keep in mind this isn’t a bible of strict recommendations, and variables are still very present on type of car, driver, surface, tires, power, and hundreds of other matters. This is a basic guideline to start you off in your thoughts. Sports Driving – choose a 1 way or a mild 1.5 way to enhance mainly the traction upon acceleration at corner exits. Deceleration side can be useful with cars that can rotate easily, to stabilize the vehicle rotation transition, and minimize character changes between on and off throttle. Notoriously difficult to turn cars are better with 1 way only so front wheels can freely rotate independently to assist in the rotation without resistance of locked LSD. We also have a “Spec-F” package tune for Type RS and MZ for covering most of the universal needs of a Front Drive sports driving needs. Sports Driving – Choose a 1 way, 1.5 way, or 2 way. The rear wheel drive car is the most variable in terms of driving style, and sports application stage. A 1 way is closest in behavior to OEM LSD, and does exhibit a more natural corner entry by rotation of all wheels with smallest of scrub angles. 1.5 way offers more scrub angle, and therefore necessitates a driver-induced mild drift angle. However, this merits on situations where corners are medium to low speeds, and accurate rotation of the car is more important to precision of trajectory and flexibility of driver line control. A 2 way require much more driver intervention as near lock state of rear wheels will resist rolling turn in. Higher scrub angles are needed (drift) but sometimes is preferable if the driver is capable, and wants this level of stability in driver-induced high angle rotation. A 2 way is also helpful in higher speed, low radius corner, where rotation rate of left and right wheels are still very similar, and resistance to veer course is enhanced by locking both directions, this especially true with high downforce scenario where traction forward is absolutely the key to pushing the increased aerodynamic load. Wide open to choices and depends greatly on driver preferences. Daily Driven: 1.5 Way, mild initial torque, and minimizing chatter, tire wear, while still having optionally high lock rate to accommodate Sunday racing use with universal character for wide range of tire choice. This is the part that is most tricky to recommend, as AWD systems for modern sports cars have electronic assistance of vehicle dynamics behavior. So, this is a general recommendation based on more generic setup. We do need to tune the LSD according to careful analysis of how the VDC/VSC control systems produce in artificially induced handling. General guideline is applying front and rear drive recommendations together, and benefits and character of those in respective axle of the car. Daily Driven: Front 1 Way, Rear 1.5 Way with very low initial torque to minimize, chatter, wear, and matched to street medium grip tire. Use of the Limited Slip Differential Gear can aid many types of situation for cars that do not see the raceway too. For example, trucks with heavy trailer or bed loads can be stabilized with a 1.5 way, on highways, and work to assist with traction without slipping and damaging with driveline slap. Regular encounters with snow, mud, rain, all can be mitigated better when driving wheels are more consistent with throttle and traction. Also, having a LSD reduced the chance of getting stuck in ice or snow, dirt, as freewheel spin does not occur, and positively engages all driving wheels on-demand. Bride x Cusco Bucket Seat in XL Size!